To Cite: Bameri F, Navidian A, Shakeri A, Nikbakht R, Pishkarmofrad Z. The Effect of Hypothermia Prevention Program on Central Temperature Changes and Hemodynamic Parameters of Women Undergoing Cesarean Section in Ali Ibn Abi Taleb, Med Surg Nurs J. 2018 ; 7(1):e82201. doi: 10.5812/msnj.82201. Background and Objectives: Postoperative hypothermia is a common and important complication of anesthesia and surgery that negatively affects the mother and the neonate. Therefore, the present study was conducted with the aim of investigating the effect of the hypothermia prevention program on central temperature changes and hemodynamic parameters in women undergoing cesarean section. Methods: In this two group quasi-experimental study, 92 pregnant women were conveniently selected, who were candidates for cesarean section under spinal anesthesia in Ali Ibn Abi Talib hospital, Zahedan, Iran, 2017. Then, they were allocated randomly in two intervention and control group. The intervention group received a hypothermic prevention program. Central temperature, blood pressure, and pulse rate of the patients were measured and recorded seven times. Data analysis was performed using repeated measures analysis of variance in SPSS software, version 21. Results: The results showed that the pattern of temperature changes in the groups was significantly different over time (P = 0.001). However, there was no significant difference between the groups considering the hemodynamic parameters. Conclusions: The hypothermia prevention program is effective in reducing the central temperature loss and can reduce its severity after the surgery in women undergoing cesarean section. Hypothermia, which is defined as a central body temperature of less than 36°C, is an unintentional post-operative phenomenon. It can be as a result of suppression of the central circuitries for body temperature regulation caused by anesthetics and sedatives (1). There are many risk factors for hypothermia during and after surgery, including prolonged exposure of large surfaces of the skin and internal organs during surgery to the cold air of operating room, type of surgery (thoracic, abdominal, or pelvic surgery), low operating room temperature, infusion of large volumes of cold liquids intravenously, washing the surgical wound, breathing cold and dry gas, blowing cool air into the body cavities, high anesthesia duration, low weight of patient, and gender of female (2-5). According to the literature, more than 46% of patients undergoing abdominal surgery were hypothermic during surgery, and one third of them were hypothermia until arrival at the recovery room (6). The complications of hypothermia entail cardiac ischemia, platelet and coagulation disorders, increased susceptibility to surgical wound infections, decreased metabolism of anesthetics and muscle relaxants, and prolonged hospitalization (2, 7). Many patients with hypothermia recall their discomfort from feeling cold after anesthesia as one of their worst surgical experiences (8). Hypothermia increases the duration of the effect of inhaled and intravenous medications (3). In regards to the evidence, postoperative hypothermia leads to severe consequences such as reduced blood flow in all systems, cardiac dysfunction, increased oxygen demand, decreased metabolism, platelet function impairment, and increased wound sensitivity (9). Decrease in body temperature and the subsequent shivering can result in tachycardia, increased catecholamines release, vasoconstriction, decreased blood flow, and metabolic acidosis (10, 11). Hypertension, tachycardia, and tachypnea are among the red flags that are often affected by the use of muscle relaxants and other medications during surgery (12). Elderly and pediatric patients, female patients, and patients with cachexia, burns, adrenal insufficiency, and hypothyroidism are more susceptible to postoperative hypothermia (13). Caesarean section is one of the most common surgical procedures. Its rate has increased from 4.5% in all deliveries from 1970 to 31.8% in 2007 (14, 15). Anesthesia exposure to perform caesarean section leads to heat loss in pregnant women due to the effects of anesthetic drugs on vascular mechanisms regulating body temperature, opening the abdomen, and getting wet of surgical coverage with blood and amniotic fluid (16). Nowadays, various pharmaceutical and non-pharmaceutical solutions have been used to prevent hypothermia. Warming and moistening the airway, warming the skin using warm coats, using a circulating water system and compressed air, the infusion of warm intravenously administered liquids, and warm washing are among the non-medical methods used in various studies (9, 17-21). Diagnosis of postoperative hypothermia by nurses is essential for patient safety management due to the fact that patient support is one of the roles of nurses in the operating and recovery rooms (16, 22). Therefore, it is necessary to use several strategies to prevent hypothermia. There are few studies conducted to evaluate the effects of several interventions performed simultaneously to prevent hypothermia; therefore, in this study, the texts of the post-anesthesia nursing and the guidelines recommended by the American society of anesthesiologists (ASA) is reviewed to prevent unwanted post-operative hypothermia (23). Then, to prevent the rate and severity of postoperative hypothermia by conducting a “post-operative hypothermia prevention program” consisting of three simultaneous, uncomplicated, and low-cost nursing cares in order to improve health and comfort of the patients and prevent the complications caused by hypothermia. The mentioned cares include using warm solutions for surgical skin preparation, infusion of warm fluids, and warming recovery by warm-water bags. The present study was conducted to determine the effect of the hypothermia prevention program on the central temperature and hemodynamic parameters in women undergoing cesarean section under spinal anesthesia. The present study is a quasi-experimental study with two groups and Iranian registry of clinical trials No. IRCT20171002036505N1, approved by the deputy of research and technology and the ethics committee of Zahedan University of Mefical Sciences, Zahedan, Iran. This study was conducted among pregnant women, who were candidates for a cesarean section, and referred to the operating room of Ali Ibn Abi Taleb hospital, Zahedan, Iran, 2017. The sample size was calculated as 42 subjects per group based on the study performed by Behdad et al. (24), in 2012 with 95% confidence interval and 90% test power and the following formula. Finally, a total of 92 individuals (46 subjects per group) were included, considering the sample attrition. The subjects were selected through convenience sampling method and based on the inclusion criteria entailing the termination of pregnancy at the gestational age of 37 to 42 weeks, healthy ears for controlling tympanic temperature, healthy amniotic membrane, and healthy thyroid gland. In addition, the exclusion criteria included receiving corticosteroid, non-steroidal anti-inflammatory analgesics, and magnesium sulfate during 24 hours prior to cesarean section, as well as having cardiovascular disease, diabetes, chronic hypertension, preeclampsia, drug addiction, fever, polyhydramnios, and oligohydramnios. The drug and past medical history of women were obtained using three sources of the patient, patient companion, and the patient’s history through the medical records. After obtaining approval from the ethics committee of the University and permission from the head of the hospital, the researcher referred to the hospital operating room, introduced himself to the supervisor of the operating room, and provided explanations on how to conduct the research project. At first, 46 eligible patients, who were referred to the operating room in different shifts for cesarean section, were selected and assigned into the control group. In the control group, the patients received routine operating room care including disinfecting the surgical site and infusion of fluids at the operating room temperature. After surgery, they were transferred to the recovery room and placed on beds with a blanket cover. The tympanic temperature was measured using tympanic thermometer (Emperor of Gadgets, Canada). Hemodynamic parameters including systolic and diastolic blood pressure was measured by physiological monitoring in the operating room, and pulse rate was measured seven times by a person who was an expert in anesthesia and was responsible for the patient in the operating and recovery room (prior to the administration of a general anesthetic, after induction of anesthesia, before surgery, 30 minutes after surgical start time, after surgery, the time of entering to the recovery room, and 30 minutes and 1 hour after the patient transferred to the recovery room). All the obtained information was listed in the checklist. Then, 46 eligible pregnant women, who were given to the operating room in different shifts for a cesarean section, were assigned into the intervention group. Before the beginning, the goals and method of the study were explained to the participants and written informed consent was obtained from all of them. In the intervention group, the surgical site was disinfected with warm povidone-iodine solution (with the temperature of 32°C) by surgical technicians based on the ASA guidelines for the prevention of post-operative hypothermia. For each patient, 2 to 3 L of intravenous fluids were warmed with a warmer (Kavoosh medical instrument, Iran) up to the temperature of 38°C to 40°C, and then infused to the extent of patients’ needs. After the completion of surgery, the patients were transferred to the recovery beds, which were prepared 30 minutes before using two or three warm-water bags. The central temperature and hemodynamic parameters, including systolic and diastolic blood pressure and pulse rate, were recorded seven times by the person who was an expert in anesthesia, was responsible for the patient in the operating room as well as the recovery department, and recorded on the checklist. It should be noted that the responsible experts in anesthesia and surgical technicians did not inform the patients’ classification in each group. Data were collected using demographic characteristics form, surgical and anesthetic information, and a checklist for recording hemodynamic parameters. The scientific validity of the data entry form was obtained through qualitative approach for content validity and confirmed by the faculty members of the university. The reliabilities of the thermo hygrometer (ZOGLAB Microsystem Co., Ltd, China) and monitoring device (Heal Force Bio-Meditech Holdings Limited, China) were determined by their accuracy, calibration, and sensitivity. The biomedical engineer in charge of hospital equipment was asked to calibrate these devices and verify their accuracy prior to the study and every 48 hours after its beginning. In this study, the temperature and humidity of the operating and recovery rooms and corridors were monitored every half-hour by a thermo hygrometer and maintained within the standard range of 23°C - 24°C and 55%, respectively. Data analysis was performed using the descriptive statistics including mean, frequency, standard deviation, and percentage. In addition, data were normally distributed; therefore, independent samples t-test and Chi-squared were used to compare quantitative and qualitative demographic variables such as age and gender between the groups, respectively. Moreover, repeated measure analysis of variance (ANOVA) was applied to determine the effects of intervention. In all the measurements, P value less than 0.05 was considered statistically significant. There was no significant difference between the groups considering the variables of age, gestational age, duration of operation, temperature and humidity of the operating and recovery rooms, and volume of infused serum (P > 0.05). The mothers’ central temperatures were assessed seven times in both the control and intervention groups and the comparison of their means is presented in Table 1. The results of repeated measure ANOVA demonstrated a significant difference between the groups considering the mean of the temperatures; the mean central temperature in the control group was lower than the intervention group (P = 0.001; Table 2). On the other hand, there was a significant interaction between grouping and time, which revealed that the temperature variability was projected to decrease. 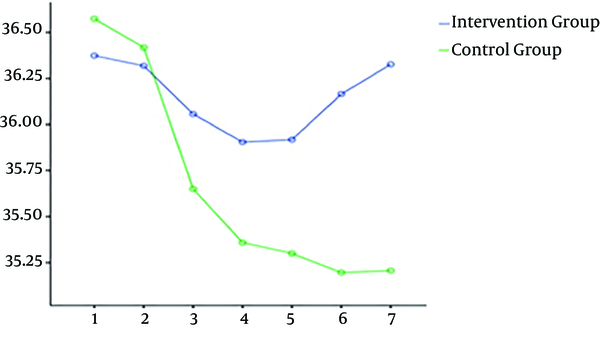 However, this decrease was less in the intervention group than in the control group (P = 0.001). The mean temperatures of the control and intervention groups, after the entrance to the operating room, were 36.57°C and 36.37°C, respectively. These parameters became 35.20°C and 36.32°C one hour after entering the recovery, respectively. Additionally, the temperature drop was different in the groups (Figure 1). Except for the time of anesthesia induction, no significant difference was observed between the groups in terms of the mean temperature. The mean temperature of the control group was significantly lower than the intervention group. Figure 1. Mean temperature of patients’ central temperature at different times in the groups. Time 1: after entering the operating room Time 2: after induction of anesthesia, Time 3: 30 minutes after starting surgery time 3: immediately after completion of surgery Time 4: patient arrival time to the recovery Time 5: 30 minutes after entering the recovery room Time 6: 30 minutes after entering the recovery room. The mean temperature of the control group was significantly lower than that of the intervention group within the time interval of post-anesthetic stage to 60 minutes after entering the recovery room. However, no statistically significant difference was observed between the two groups in terms of the mean temperature at the time of anesthetic induction. The mothers’ hemodynamic parameters including systolic and diastolic blood pressure as well as pulse rate were investigated seven times in both groups. Comparison of their mean and body temperature at different times in the control and intervention groups is presented in Table 1. Furthermore, there was no significant difference between the groups in terms of mean systolic and diastolic blood pressure and pulse rate (P = 0.30, P = 0.93, and P = 0.11, respectively). In addition, no significant difference was observed between the groups in terms of the grouping and time interaction in any of the hemodynamic parameters. According to the results, the pattern of hemodynamic changes, including systolic and diastolic blood pressure and pulse rate, was the same in both groups (P = 0.11, P=0.52, and P = 0.22, respectively). The mean systolic blood pressure in the control group from 117.89 mmHg after entering the operating room changed to 115.13 mmHg 60 minutes after entering the recovery room. In the intervention group, the mean blood pressure changed from 125.43 mmHg at the entrance to the operating room to 117.26 mmHg 60 minutes after entering the recovery room. Additionally, the mean diastolic blood pressure in the control group was 70.37 mmHg after entering the operating room, which changed to 71.85 mmHg 60 minutes after entering the recovery room. In the intervention group, this parameter altered from 74.20 mmHg to 72.20 mmHg in the same stages. The mean pulse rate in the control group was changed from 103.02 pulses per minute after entering the operating room to 99.76 pulses per minute 60 minutes after entering the recovery room. In the intervention group, the pulse rate changed from 107.96 to 101.89 pulses per minute in these stages. According to the results of our study, the standard interventions were effective in reducing the postoperative central temperature. Regarding the evidence, using postoperative hypothermia prevention program reduces the unwanted side effects of hypothermia. In addition, our results indicated that the central temperature of women undergoing cesarean section during operation and time of transfer to recovery in the intervention group was less than that of the control group. Additionally, the results showed that the hypothermia prevention program had no effect on hemodynamic parameters in patients. The results of the study conducted by Hassankhani et al. (21), on the effect of warm fluid infusion on hemodynamic status and postoperative shivering in orthopedic surgeries showed a significant difference in both groups in terms of the mean esophageal temperature of patients at 15, 30, 45, and 60 minutes post-anesthetic. There was a downward trend in central temperature of both groups; however, this decrease was more in the control group. Moreover, according to the results of the mentioned study, there was no significant difference in the pulse rate of the patients before, during, and after surgery. These results were consistent with the results of the present study (21). The results of the study performed by Oshvandi et al. (25), in 2015 demonstrated that the infusion of warm fluids prevented central temperature loss after general anesthesia in mothers undergoing cesarean section. In congruence with the results of the present study, the comparison of mean systolic blood pressure and heart rate of patients did not show any significant difference between the intervention and control groups. Nevertheless, there was a significant difference between the groups in terms of diastolic blood pressure, which was inconsistent with our results (P < 0.05) (25). This inconsistency might be due to various methods of anesthesia. They used general anesthesia, while we used local anesthesia. Yokoyama et al., in 2009, performed a study on women undergoing cesarean section by spinal anesthesia, from the time of delivery to 45 minutes later; the central temperature of the women in the intervention group (receiving intravenous fluids at a temperature of 41°C) was significantly higher than the control group (26). In line with our results, it can be concluded from the mentioned study that this intervention was intended to reduce the effect of reducing the central body temperature after cesarean section (Table 3). Considering the results of the study carried out by Abbasi et al., in 2011 on the effect of general and spinal anesthesia on the central temperature of mother and neonate after cesarean section, no hypothermia was observed during surgery. Nonetheless, a mild hypothermia was recorded in two groups during recovery (27). Perhaps the reason for the lack of hypothermia during operation was the use of warm liquids (37°C) and the operating room temperature (26°C). This result was consistent with the results of the present study. The reason for a slight decrease in temperature in the recovery was the reduction of the temperature of the recovery room to 20°C. Furthermore, the results of the study conducted by Woolnough et al. (28), in 2009, confirmed that the warming of intravenous fluids in the warmed was as effective as heating the intravenous fluids with the Hot Line heater. Further, increasing the temperature of the fluids to 41°C and 45°C was more effective in increasing the maternal central temperature (28). The compatibility of the results of this study with the mentioned study was due to the similarity of the method, namely, the heating of intravenous fluids. Kurz et al. (29), concluded that there was no significant difference in pulse rate and blood pressure in young and healthy, hypothermic, and normothermic . Behdad et al., performed a similar study on women undergoing cesarean section and demonstrated that the intervention resulted in the prevention of hypothermia during recovery for half-hour and one hour after entering the recovery (24). In the mentioned study, the intravenous fluids were warmed by a warmer up to 38°C. Chakladar et al., in 2014, examined the effect of the use of warming mattress on the incidence of hypothermia in patients undergoing cesarean section and revealed the positive effect of this intervention on decreasing the incidence of unwanted postoperative hypothermia (30). Consistent with our results, these studies showed the impact of standard interventions on reducing the central temperature and emphasized the importance of the implementation of this program in the operating room. Contrary to the results of the present study, which showed no significant change in heart rate and systolic and diastolic blood pressure in the control and intervention groups, Frank et al. (31), confirmed that hypothermic patients had a low heart rate, systolic blood pressure, and high diastolic blood pressure during the postoperative period. The hypothermia prevention program was effective in women undergoing cesarean section and could reduce the postoperative hypothermia. Considering the positive effect of the implementation of this program on women undergoing cesarean section by spinal anesthesia, further studies are recommended to assess the impact of this program on postoperative hypothermia resulting from major abdominal and thoracic surgeries, as well as general anesthetic in children and adults. This study was carried out under the financial support of Zahedan University of Medical Sciences, Zahedan, Iran. This paper is a part of an approved thesis (No. 8319) and with the code of ethics of IR.Zaums.Rec.1396.59. The authors appreciate the cooperation of the deputy of research of the University, department of technology, faculty, and the operating room staff, as well as the participation of patients in the hospital of Ali ibn Abi Taleb in Zahedan. 1. Al-Qahtani AS, Messahel FM. Benchmarking inadvertent perioperative hypothermia guidelines with the National Institute for Health and Clinical Excellence. Saudi Med J. 2011;32(1):27-31. [PubMed: 21212912]. 2. Madrid E, Urrutia G, Roque i Figuls M, Pardo-Hernandez H, Campos JM, Paniagua P, et al. Active body surface warming systems for preventing complications caused by inadvertent perioperative hypothermia in adults. Cochrane Database Syst Rev. 2016;4. CD009016. doi: 10.1002/14651858.CD009016.pub2. [PubMed: 27098439]. 3. Reynolds L, Beckmann J, Kurz A. Perioperative complications of hypothermia. Best Pract Res Clin Anaesthesiol. 2008;22(4):645-57. doi: 10.1016/j.bpa.2008.07.005. [PubMed: 19137808]. 4. Campbell G, Alderson P, Smith AF, Warttig S. Warming of intravenous and irrigation fluids for preventing inadvertent perioperative hypothermia. Cochrane Database Syst Rev. 2015;(4). CD009891. doi: 10.1002/14651858.CD009891.pub2. [PubMed: 25866139]. 5. Kongsayreepong S, Chaibundit C, Chadpaibool J, Komoltri C, Suraseranivongse S, Suwannanonda P, et al. Predictor of core hypothermia and the surgical intensive care unit. Anesth Analg. 2003;96(3):826-33. table of contents. doi: 10.1213/01.ANE.0000048822.27698.28. [PubMed: 12598269]. 6. Hedrick TL, Heckman JA, Smith RL, Sawyer RG, Friel CM, Foley EF. Efficacy of protocol implementation on incidence of wound infection in colorectal operations. J Am Coll Surg. 2007;205(3):432-8. doi: 10.1016/j.jamcollsurg.2007.04.042. [PubMed: 17765159]. 7. Melling AC, Ali B, Scott EM, Leaper DJ. Effects of preoperative warming on the incidence of wound infection after clean surgery: a randomised controlled trial. Lancet. 2001;358(9285):876-80. doi: 10.1016/S0140-6736(01)06071-8. [PubMed: 11567703]. 8. Widman J, Hammarqvist F, Sellden E. Amino acid infusion induces thermogenesis and reduces blood loss during hip arthroplasty under spinal anesthesia. Anesth Analg. 2002;95(6):1757-62. table of contents. doi: 10.1097/00000539-200212000-00053. [PubMed: 12456453]. 9. Miller RD, Eriksson LI, Fleisher LA, Wiener-Kronish JP, Young WL. Miller's anesthesia. New York: Churchill Livingstone; 2010. 10. Sessler DI, Kurz A. Mild perioperative hypothermia. Anesthesiol News Special Ed. 2007:61-72. 11. Rostami Nezhad A, Karimi Z, Khosravi A, Chohedri AH, Ghaffarian Shirazi HR. [The effect of suppository Diclofenac Na on postoperative shivering in elective cesarean section surgery]. Armaghane-Danesh J Yasuj Univ Med Sci. 2004;9(35):31-7. Persian. 12. Myles PS. Prevention of awareness during anaesthesia. Best Pract Res Clin Anaesthesiol. 2007;21(3):345-55. doi: 10.1016/j.bpa.2007.04.004. [PubMed: 17900013]. 13. Sessler DI. Complications and treatment of mild hypothermia. Anesthesiology. 2001;95(2):531-43. doi: 10.1097/00000542-200108000-00040. [PubMed: 11506130]. 14. Martin JA, Hamilton BE, Ventura SJ. Births: preliminary data for 2007. Natl Vital Stat Rep. 2009;57(12):1-18. 15. MacDorman MF, Menacker F, Declercq E. Cesarean birth in the United States: epidemiology, trends, and outcomes. Clin Perinatol. 2008;35(2):293-307. v. doi: 10.1016/j.clp.2008.03.007. [PubMed: 18456070]. 16. Andrzejowski J, Hoyle J, Eapen G, Turnbull D. Effect of prewarming on post-induction core temperature and the incidence of inadvertent perioperative hypothermia in patients undergoing general anaesthesia. Br J Anaesth. 2008;101(5):627-31. doi: 10.1093/bja/aen272. [PubMed: 18820248]. 17. Hoseinkhan Z, Behzadi M. [Morphine, Pethidine and Fentanyl in postoperative shivering control: a randomized clinical trial]. Tehran Univ Med J. 2007;64(12):57-63. Persian. 18. Movassaghi GR, Palideh H. [Comparison between anti-shivering effects of meperidine and methadone]. Razi J Med Sci. 2002;9(28):107-12. Persian. 19. Kranke P, Eberhart LH, Roewer N, Tramer MR. Postoperative shivering in children: a review on pharmacologic prevention and treatment. Paediatr Drugs. 2003;5(6):373-83. doi: 10.2165/00128072-200305060-00003. [PubMed: 12765487]. 20. Bhattacharya PK, Jain RK, Agarwal RC. Post anesthesia shivering (PAS): A review. India J Anaesth. 2003;47(2):88-93. 21. Hasankhani H, Mohhammadi E, Nighizade MM, Moazzami F, Mokhtari M. The effects of warming intravenous fluid on perioperative hemodynamic status, postoperative shivering and recovery in orthopedic surgery. Shiraz E Med J. 2004;5(3). 22. Fikkert JA. Postoperative Responses to Hypothermia: Nursing Considerations. Cardiac Surgery. 1992. p. 117-25. 23. Pikus E, Hooper VD. Postoperative rewarming: are there alternatives to warm hospital blankets. J Perianesth Nurs. 2010;25(1):11-23. doi: 10.1016/j.jopan.2009.12.004. [PubMed: 20159530]. 24. Behdad S, Abdollahi MH, Ayatollah V, Hajiesmaeili M. R , Molanouri H, Heyranizadeh N. [The effect of heating liquids on the temperatures central mother cesarean section delivery]. J Anesthesiol Pain. 2012;8(2). Persian. 25. Oshvandi K, Shiri FH, Fazel MR, Safari M, Ravari A. The effect of pre-warmed intravenous fluids on prevention of intraoperative hypothermia in cesarean section. Iran J Nurs Midwifery Res. 2014;19(1):64-9. [PubMed: 24554962]. [PubMed Central: PMC3917187]. 26. Yokoyama K, Suzuki M, Shimada Y, Matsushima T, Bito H, Sakamoto A. Effect of administration of pre-warmed intravenous fluids on the frequency of hypothermia following spinal anesthesia for Cesarean delivery. J Clin Anesth. 2009;21(4):242-8. doi: 10.1016/j.jclinane.2008.12.010. [PubMed: 19502035]. 27. Abbasi HR, Ayatollah V , Behdad S, Zare H, Trzjany M, Heyranizadeh N. [The effect of general anesthesia and spinal anesthesia for cesarean delivery on maternal and neonatal the core temperature]. J Anesthesiol Pain. 2011;5(2). Persian. 28. Woolnough M, Allam J, Hemingway C, Cox M, Yentis SM. Intra-operative fluid warming in elective caesarean section: a blinded randomised controlled trial. Int J Obstet Anesth. 2009;18(4):346-51. doi: 10.1016/j.ijoa.2009.02.009. [PubMed: 19665366]. 29. Kurz A, Sessler DI, Narzt E, Bekar A, Lenhardt R, Huemer G, et al. Postoperative hemodynamic and thermoregulatory consequences of intraoperative core hypothermia. J Clin Anesth. 1995;7(5):359-66. doi: 10.1016/0952-8180(95)00028-G. [PubMed: 7576669]. 30. Chakladar A, Dixon MJ, Crook D, Harper CM. The effects of a resistive warming mattress during caesarean section: a randomised, controlled trial. Int J Obstet Anesth. 2014;23(4):309-16. doi: 10.1016/j.ijoa.2014.06.003. [PubMed: 25266313]. 31. Frank SM, Fleisher LA, Breslow MJ, Higgins MS, Olson KF, Kelly S, et al. Perioperative maintenance of normothermia reduces the incidence of morbid cardiac events. A randomized clinical trial. JAMA. 1997;277(14):1127-34. doi: 10.1001/jama.1997.03540380041029. [PubMed: 9087467].